The most interesting rivalry of the AMA Outdoor National Motocross season will be Suzuki’s Travis Pastrana versus KTM’s Grant Langston. Here in the U.S., we all know Pastrana. He is not only this year’s East Coast 125cc Supercross champion, he is the reigning 125cc Outdoor National Motocross champion as well. Langston we are beginning to know. The talented, young South African arrived on U.S. soil this year with little supercross experience, but soon had the speed to win a 125cc West Coast main event. His real talent lies, however, outdoors. 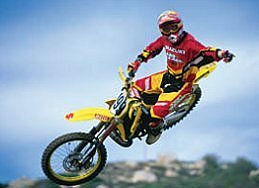 He is the reigning 125cc World Motocross champion, and we have had the pleasure of watching him ride a race here in Southern California while getting ready for the AMA Outdoor National championship series. Langston is extremely fast outdoors. He and Pastrana have already banged bars at the Motocross des Nations, and the rivalry between these two outdoors should be intense. 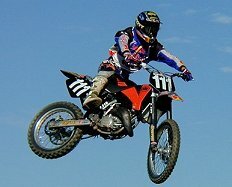 Who will win the 2001 AMA 125cc Outdoor National Motocross championship? That is a close call, but we are picking Grant Langston to beat Travis Pastrana in the series. Regardless of the outcome, however, it could lead to some of the closest racing we have seen outdoors in quite some time.